The EarthKry band was born and nurtured within the halls of the Edna Manley College of The Visual & Performing Arts in Kingston, Jamaica where four budding musicians hoped to hone their skills. Their journey began with a twist of fate which brought together keyboard player Phillip Mcfarlane , drummer Kieron Cunningham, bass guitarist Kamardo Blake and vocalist/guitarist Aldayne Haughton, to play a series of small gigs. Drawing inspiration from Bob Marley and The Wailers, The Beatles, John Holt, Peter Tosh, Jacob Miller, Black Uhuru and Steel Pulse, the group soon cemented a wholesome fusion of Roots Reggae, Souls and Rock genres for a fresh but universal sound. Much like the iconic reggae outfit The Wailers, the band chose its name, EarthKry, to signify its mission to voice the grievances of the downtrodden through the vibrations of their music. Befittingly, their debut single “9 to 5” echoes the daily tribulations of the working class who are barely able to make ends meet from the menial wages they receive. Since 2013 the band has spent much of their time creating music with other notable artistes in recording sessions while further developing their signature sound. Through the guidance of veteran drummer/ lecturer Derrick Stewart, veteran trumpeter Nambo Robinson and guitarist/former tutor Maurice Gordon, the band works towards releasing their first E.P and then debut album Hard Road in the near future. 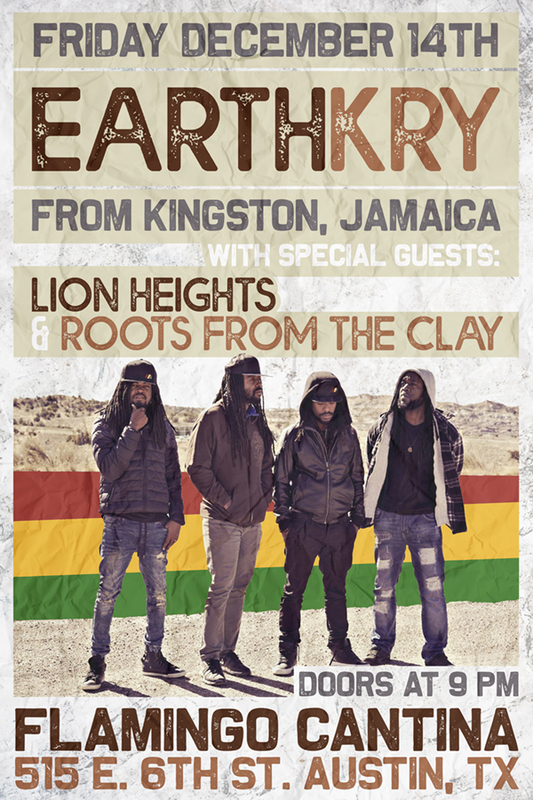 Earthkry is just coming off of a huge tour to Austraila and New Zealand with Katchafire. Local reggae heavies Lion Heights and Houston’s Roots from the Clay kick off the show.